LAYMAN'S GUIDE TO ONE - DAY INTERNATIONALS. ALL YOU NEED TO KNOW ABOUT ONE - DAY INTERNATIONALS. WHAT ARE ONE-DAY INTERNATIONALS (ODIs)? WHAT ARE ITS TOURNAMENT STRUCTURES ? LETS TAKE A QUICK LOOK AT ITS BIRTH. LIKE TO KNOW ABOUT ODIs CURRENT RULES ? "RAIN RULE" OR DUCKWORTH-LEWIS (D / L) ? Cricket frenzy will soon hit Sri Lanka. Every one will then talk and even dream about ODIs. What are they? Here is the accepted official classification. (a). All matches played in the official World Cup Competition, including matches involving Associate Member Countries. (b). All matches played between the Full Member Countries of ICC as part of an official tour itinerary. (c). All matches played as part of an official tournament between Full Member Countries. These need not necessarily be held in a Full Member Country. (d). All matches between the ICC ten Full Member Countries and Kenya. (e). Matches between Kenya on natural turf pitches conforming with Standard Playing Conditions. Note: Matches involving the 'A' teams of Full Member Countries shall not be classified One Day Internationals. They occur in Four major forms. This involves all Test Nations and qualifying Associate Nations. It Consists of a round-robin group stage, a Super Six stage, Semifinals, and Finals and is held once in four years. The International Cricket Council determines the venue. Next World Cup is scheduled in 2007 in West Indies & Canada. International Cricket Council Champions Trophy. This again involves all Test Nations and qualifying Associate Nations. It Consists of knockout games (if a team loses a single game, it is "knocked out" of the tournament) and is held once in four years between World Cups. The International Cricket Council determines venues. Involves Three Nations. Consists of a round-robin group stage, each team playing the other, two or three times, and finals. The semifinals and finals are single games, except in the annual VB Series Triangular Tournament, when the finals are a three game series. Its played in one of the three participating nations or in neutral venues. Involves Four Nations, but are now very rare. The start of the sixties was the period when cricket as a spectator sport dwindled, as its overall financial position rapidly deteriorated. Radical remedial measures were urgently needed to keep the game alive the world over. It was the time when hardly anyone was willing to either advertise at cricket matches or sponsor a worthwhile club or a player. The timely emergence of "One-day 0vers-limited Cricket", not only ensured the survival of Cricket, but also re-vitalised and re-shaped the traditional game. BIRTH AND ESTABLISHMENT OF ONE-DAY CRICKET. In an effort to keep First-Class Cricket in England alive during the 2nd World War, matches of one-day duration were staged between the Services and Sir Pelham Warners XI. The first ever tournament in an organised manner on record, involved the four English Counties, Leicestershire, Derbyshire, Northamptonshire and Nottinghamshire and was played for the Midlands Trophy commencing 02nd May 1962. Gillette, the reputed razor-blade company then cashed in on the success of this tournament and offered a cup to sponsor an 0vers-limited knock-out tournament amongst the then first-class counties in England. Realisation of the potential of Sunday afternoon Cricket by the John Player Company, the cigarette giants, saw the birth of Sunday-League 40 overs per side tournaments in 1969. A new look "55-overs per side by a fixed time" tournament sponsored by Benson & Hedges, was soon added to the annual English Cricket calendar. Many businesses then in England soon realised the value to be derived from sponsoring such cricket tournaments, drawing massive crowds and enjoying substantial radio coverage. Participating Counties and Clubs too, soon began to draw revenue from smaller firms, who recognised the 0ne-day game as an ideal occasion on which to entertain their guests. This soon led to many Counties and Clubs developing executive suits and luxurious areas where companies could not only entertain on match days, but also have their other regular conventions and meetings on other days. One-day cricket came as a great consolation for many of those unable or reluctant to take time off or even have patience to sit through 3, 4 or 5 days of a Test Match. Unbelievable spectator interest and massive sponsorships soon opened a highly lucrative advertising market. Competition ran sky high amongst Television Channels to obtain exclusive tv rights to telecast these matches all over the world. The extensive live TV coverage brought the game into living, dining and bedrooms and even to kitchens. Thus amongst one-day spectators, a new breed who were previously uninterested in Cricket soon emerged, enthralled by the excitement and carnival atmosphere one-day cricket brought in. In addition, the players found the high drama of the contests always stimulating and the response of capacity crowds most rewarding, with live telecasts giving them world-wide publicity instantly. To keep the momentum going, organisers of these tournaments together with the sponsors, offered prizes greater in number, far higher in value and more glamorous and attractive than they ever used to be. BIRTH OF THE ONE-DAY INTERNATIONALS. Without a ball being bowled, a heavy continuous rain prevented any play even on the third day of play, in the 3rd test between England and Australia in Melbourne on New Years Eve of 1971. To cheer-up the bitterly disappointed New Year holiday crowd after the abandoning of the Test Match, a one-day official match of 40 x 8 ball overs per side match was hurriedly arranged between the two Countries on the scheduled 5th day of the Test. This experiment was an immediate success, as a crowd of over 46,000 paid Australian Dollars 33,894 to witness this accidental historic happening. It was the start of a revolution that threatened to dethrone Test Match Cricket ! With the morale running sky high with this success, the then Test and County Cricket Board of England (TCCB) offered the Australian Cricket Board, to stage the first ever series of one-day internationals, made up of 03 x 60 0vers per team games, at the end of the Aussies 1972 tour to England. The bait was an extra £ 2,500 per match. ACB hurriedly then slotted them into the already approved tour itinerary. The inaugural tournament, sponsored by the Prudential Insurance Company Limited, was played in front of packed houses, at three venues, Lords, Old Trafford and Edgbaston. DEVELOPMENT OF THE ONE-DAY GAME. A logical extension of these one-day international competitions, an idea of staging a competition to determine "World Champions in One-day 0vers-limited Cricket", was mooted by the former Somerset County CC Captain Mr Ben Brocklehurst. Prudential Insurance Company agreed to sponsor the first ever competition. The tournament was held simultaneously at six Test Match venues in England, with 19 matches in all, condensed into just two week-ends, amongst the then 06 ICC Full Member and o2 Associated Member (Sri Lanka and East Africa) Countries. The impact of this inaugural World Cup was so enormous; it engendered the large number of ODIs that now dominates the international cricket scene throughout the cricket world today. As many other ICC member countries soon realised the benefits in terms of prestige, publicity and finance (in particular) etc., that mere participation itself would bring in, they were keen to become "Associate Members of the ICC". This then led to the inaugural of another quadrennial qualifying 0vers-limited Tournament amongst them, for the Trophy offered by the ICC., with the winners and runners-up being afforded the opportunity to take part in the following World Cup Tournament. A great cricketing storm erupted in 1977 in the form of Kerry Packer and his World Series Cricket. It revolutionised the game, bringing in attractive coloured clothing, white balls and playing under flood-lights. This led to the birth of Triangular and Quadrangular series of 0vers-limited matches. Asian Cricket Conference was formed in 1983 to build and foster healthy Cricket in the Asian region and led to many a development, including the Bi-annual Asian Cup Tournament, bi-annual Sharjah tournament in the UAE. With 0vers-limited Cricket soon proving to be the financial elixir to the traditional game, many tournaments surfaced round the world, Rothman Cup in Sharjah and then in New Zealand, McDonalds Cup in Australia, Singer and Pepsi Cups in Asia, being the prominent ones. KNOW ABOUT ODIs CURRENT RULES ? SLOW OVER - RATE PENALTIES. (2000 Code, 2nd Edition 2003). Here are few of the 30 AMENDMENTS that came into effective from 24th September 2003. 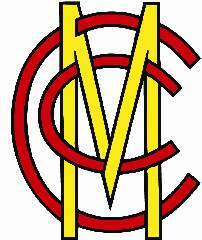 Click the MCC Logo to know more. Bat and Ball gauges for Umpires to check randomly and prevent illegal sizes comes in. There shall be "no reference made to the TV Umpire to ascertain if a catch has been made clear, except in the unusual event of "both" on-field Umpires having obscured the view of what had happened. The TV Umpire has then to determine if the batsman has been caught "cleanly" and NOT whether or not, he had actually hit the ball with the bat or touched the gloves. However, the field umpires are empowered to refer to the TV Umpire, to determine if a catch made has been taken off a "bumped" ball or not. WHAT IS "RAIN RULE" OR DUCKWORTH - LEWIS (D / L) METHOD? In brief it is an internationally accepted system adopted by the ICC and all the other Cricket Boards of the ICC member countries, as an answer to the problem of "target-resetting" in overs-limited cricket, when matches are shortened after the commencement and hence overs are lost, due to one or more suspensions of play. HOW TO REVISE AND SET TARGETS? This has been a problem in such match situations since this version of the game emerged. The traditional method using the "average-run-rate", was based on the "false" assumption that the number of runs a side can make, is in direct proportion to the numbers of overs it has to face. It ignores the number of wickets in hand. Hence it almost always gave an unfair advantage to one side, after a resumption. Since 1992, four other methods known as, "most productive overs, Discounted total runs, Parabola method and Clark curves, came and soon disappeared due to their critical shortcomings. Frank Duckworth spent seven years at Liverpool University to gain a B.Sc.(Hons.) in physics and a Ph.D. in physical metallurgy. In working at a nuclear power station in Gloucestershire, this keen and competent armchair cricketer, gained long years of experience on the statistical analysis of data relating to performance. Tony Lewis emerged with a B.Sc. (Hons) in statistics and mathematics, an M.Sc. in statistics and a Diploma in Education, from Sheffiled University. Tony first met Frank in 1994 and their liaison began. Together, they completed a research project that involved carefully analysing the scorebooks from many hundreds of overs-limited matches, mostly internationals. They then arrived at a simplified formula, easily the fairest method so far devised. Their method could be implemented with no bias to either side, with nothing more than a single table of numbers (an over-by-over resources table, we now call them) and a pocket calculator. The England and Wales Cricket Board was the first to adopt it with their 1997 season. ICC also chose it for a number of their own tournaments. Frank and Tony both, are certainly to be congratulated and warmly remembered on addressing satisfactorily this crucial problem in 0vers-limited cricket. The D / L method works using the notion that teams have two resources at their disposal with which to make as many runs as they can. These are the number of 0vers they have to receive and the number of Wickets they have in hand. From any stage in their innings, their further run-scoring capability depends on both these two resources in combination. A single table gives the percentage of these combined resources that remain at any stage of an innings for any number of 0vers left and Wickets lost. In order to determine the correct resource percentage the batting side has remaining at any stage of its innings, the number of overs left must be identified. This number of overs left, in conjunction with the number of wickets lost, is then used to read the resource percentage remaining from the table. When a match is shortened after it has begun, the resources of one or both teams are depleted and the two teams usually have different amounts of resource for their innings. In this case a revised target must be set. The D/L method does this in accordance with the relative resources available to the two teams. If stoppages cause the team batting second to have less resources available, as is more often than not the case, then their target will be revised downwards. If, on the other hand, as often happens when the innings of the Team batting First has been interrupted, the stoppages usually result in Team batting Second having more resources available, then their target is revised upwards to correct for the extra resources they have at their disposal. Today targets are computed using the computer software in accordance with the instructions provided with that software and displayed almost immediately on the giant score-boards. In fact on completion of the innings of the side batting first, printouts are generated and provided to match referees in particular, the "resources table" on over by over basis, appropriate to that innings. LATEST REVISIONS TO D / L.
After an extensive analysis of 0vers-limited cricket matches in most recent years, in 2002 end they announced an update to their table. "The nature of the one-day game is changing;" said Duckworth "and our tables need to reflect developments in playing strategies". Lewis said that the effects of the new tables "will in most cases be to lower slightly the enhanced targets when the first innings is interrupted and to raise slightly the D/L par scores during the early part of the reply". The current Duckworth-Lewis (D / L) system sees victory targets revised on the basis of both overs remaining for the batting side and how many wickets have fallen. But a new version has been introduced after 2003 World Cup Final between Australia and India when it was felt the old system failed to take account of a side batting first posting a huge score. Australia, who beat India by 125 runs in 2003 March 23 final in Johannesburg, made a record 359 for two in their 50 overs. India, although eventually dismissed for 234 in 39.2 overs, had an unlikely chance of victory as skies darkened. With rain threatening, India, on 145 for 3 after 23 overs, were only four runs behind par," Frank Duckworth, one of the D / L system's creators, said. "Losing no more wickets and scoring 12 runs in the next two overs, followed by a terminal downpour", would have handed the title to India. "We have always been aware that, when the total set by the team batting first is much greater than average, revised targets and par scores can sometimes seem unrealistic," Duckworth added.